Although Horace Walpole’s large and impressive art collection initially remained at Strawberry Hill after his death in 1797, it was later sold off by his heir in a 24-day sale in 1842. With the sale, one of the best collections of it’s time of art, furniture, cermanics, glassware and manuscripts was scattered. 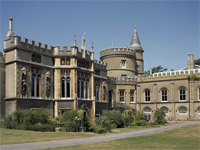 This entry was posted in News and tagged architecture, conservation, country house, heritage, horace walpole, middlesex, neo-gothic, restoration, strawberry hill, twickenham. Bookmark the permalink.